This guide helps you organize your mailing list and provides great time saving ideas for holiday gifts and messages. "We all have our own harried, hectic lives, full of professional and personal responsibilities, so we wrote A Procrastinator’s Guide to Holiday Mailings to give companies hope." 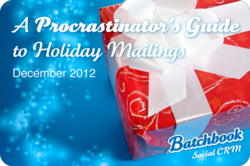 The sociable experts at Batchbook today released A Procrastinator’s Guide to Holiday Mailings. The Guide offers small businesses a roadmap through everything from sweater vest-clad team photos to iced brownies to quirky holiday videos sent via Twitter so they can quickly execute holiday greetings with personality. Batchbook is also inviting business professionals to connect via their favorite social networks and contribute the spirited ways they share holiday cheer. All are welcome to add suggestions for greetings on the BatchBlog, Twitter, Facebook, Google+, LinkedIn and Pinterest. Anyone who shares ideas will get a free gift from Batchbook.